A new edited book I have been working on with Mark Paterson is coming close to completation. We are just checking the pageproofs at the moment. The title is Touching Space, Placing Touch and it will be published by Ashgate in the the autumn. The draft cover design is shown in the thumbnail image. You can read the substantive introduction written by Mark Paterson, Sara MacKian and myself from here (this is a near final pageproof version). 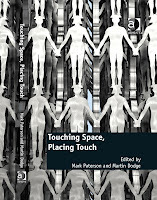 The book also contains a chapter by Rob Kitchin and myself entitled 'Towards touch-free spaces: sensors, software and the automatic production of shared public toilets' (this is a pageproof version). 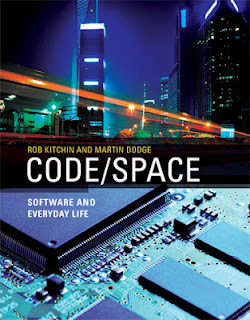 A couple of reviews for our Code/Space book have appeared recently in academic journals. Francis Harvey, from the Department of Geography, University of Minnesota, says Code/Space "is an important contribution; I only wish it had been written more with GIScience in mind. Still, it is a very worthwhile read." Read the rest of his review from the International Journal of GIS here. A second review is published in Cultural Geographies in which Matthew Wilson notes perceptively that "it is somewhat surprising that Kitchin and Dodge do not explicitly advocate coding itself as a technique for critical studies of software (alongside ethnography and genealogy) – which would be in alignment with the thrust of much contemporary digital humanities and critical GIS literatures. In what ways can code ‘speak back’ and resist discursive regimes? How might the discourse break down under the weight of code? How are we to code differently?"